A funny thing happened when I stepped outside on Saturday afternoon. The temperature had warmed up - to above freezing for the first time in what seemed like eons - and the road was strangely free of snow and ice. Neighbors to the left and right of our house had emerged into this strange streetscape, rubbing their eyes in the bright sunshine, almost as if they were groundhogs awaking from a long hibernation. I quietly paced the cul-de-sac in front of the house, and for what seemed like a long while debated with myself the merits of hauling my bicycle out of the basement, prepping it and taking it for a shakedown ride through the 'hood. It sure seemed warm enough, and the nearly bare pavement beneath my feet beckoned for more. The road was calling. 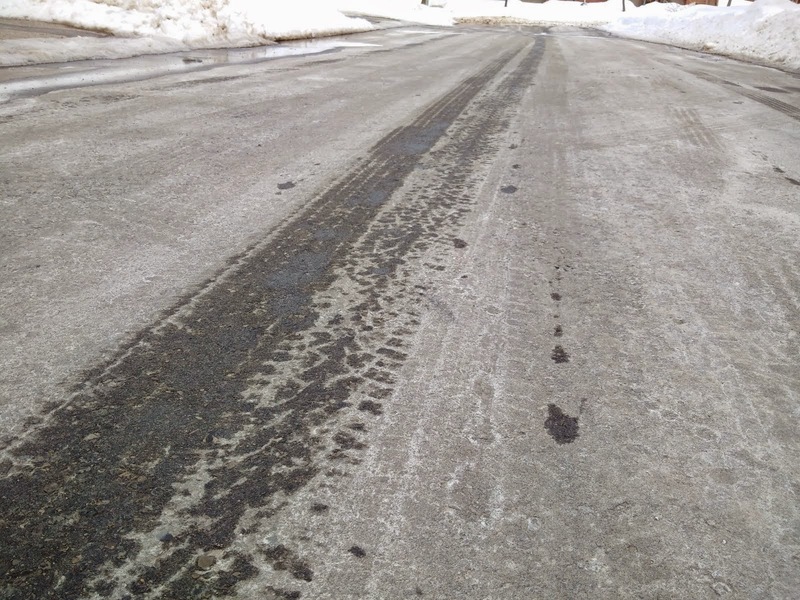 As it was, the rest of the neighborhood road network turned out to be a soggy, icy, pothole-filled mess. So with visions of trashing my rims and ending up in a dirty snowbank, I went back into the house and got back into daddy-weekend-errand mode. The ride will have to wait, but not for too much longer. Your turn: It's hit the road week, and I'd like to use this new Thematic Theme to explore anything and everything associated with the road. They take us near and far, connect us, and call us. In the process, they make us feel something, too, and I'm hoping everyone's photos this week evoke that sentiment. Are you in? If so, grab a shot of something that suggests "road", and share it on your blog or website. Leave a comment here letting folks know where to find it. Already posted something earlier? Share that, too: We love sharing, after all. Visit other participants to spread the fun, and be sure to pop back through the week to see what everyone else is up to. Here's more info on how Thematic works. Thanks, and enjoy! Perhaps it's time to take another road trip! I waited all day for a jogger to come along so that I could post a road-runner. Unfortunately you will have to settle for something else instead. Carmi, our neighbor woke up to this surprise. Surely spring cannot be too far away now? Thank you for hosting. I guess I messed that link up.